The Colossus only stood for 56 years before it was levelled by an earthquake in 226 BC. The force of the earthquake was such the statue snapped off at the knees and fell over on to the land. Ptolemy III offered to pay for the reconstruction of the Colossus, but the Rhodians refused, believing that they had offended Helios. Computer simulations have since revealed that the earthquake caused a cascade failure in the rivets holding the Colossus together, causing the arms to separate at the shoulder and the knees to buckle. 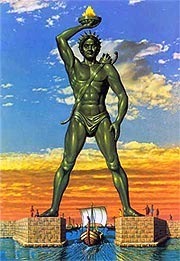 The Rhodes earthquake of 226 BC, which affected the island of Rhodes, Greece, is famous for having toppled the large statue known as the Colossus of Rhodes. Following the earthquake, the statue lay in place for nearly 8 centuries before being sold off by invaders. While 226 BC is most often cited as the date of the quake, sources variously cite 226 or 227 BC as dates when it occurred. The Colossus stood proudly at the harbour entrance for some fifty-six years. Each morning the sun must have caught its polished bronze surface and made the god's figure shine. 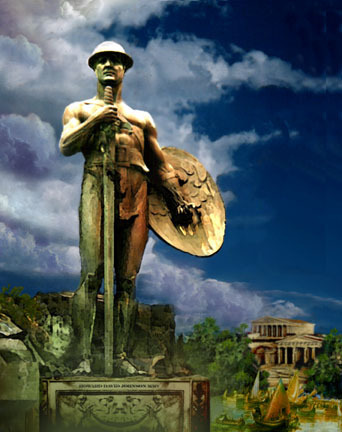 Then an earthquake hit Rhodes and the statue collapsed. Huge pieces of the figure lay along the harbour for centuries.